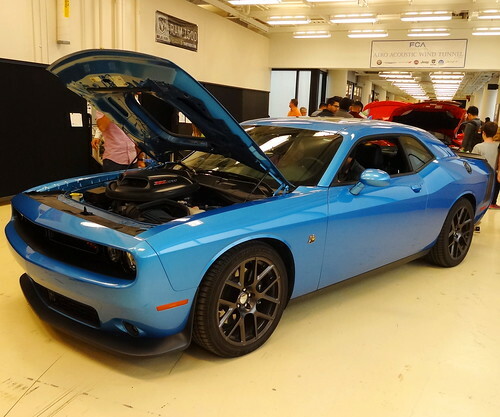 Recently, a friend asked if we’d like to be his guest for the 25th Anniversary open house at the Chrysler Technical Center in Auburn Hills…Uhhh, Yeah! 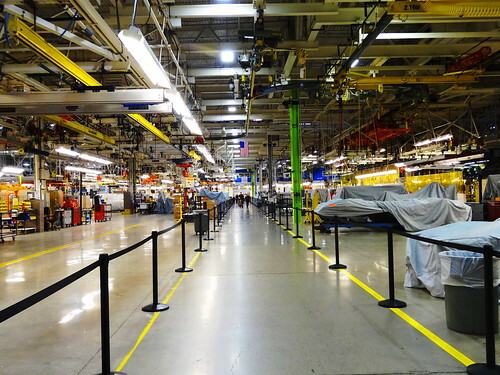 We assumed it would be a cursory tour, surely Chrysler wouldn’t allow people to poke around their engineering and design epicenter… man, were we in for a surprise!!?? The best news was reading “photos allowed” in the invitation, seriously? We are so there…. Chrysler Corporation was founded June 6, 1925 by Walter P Chrysler who re-organized the Maxwell Motor Company into his namesake. Always engineering innovators they were first to mass-produced cars with four-wheel hydraulic brakes, rubber engine mounts, air conditioning, electric windows and anti-lock brakes, to name a few. They also developed a road wheel with a rigid rim designed to keep a deflated tire from flying off the wheel; this safety wheel was eventually adopted by the auto industry worldwide. Back in 1955 they built the first production car to reach the 300 horsepower mark with their aptly named Chrysler 300, yep, that’s where it came from. 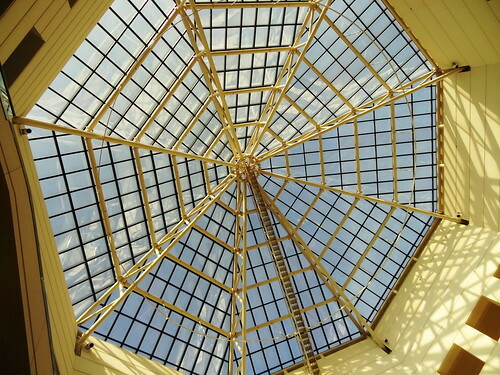 We meet our friend in the parking lot and make our way to the entrance of the mammoth building–get this: at 5.3 million sq. 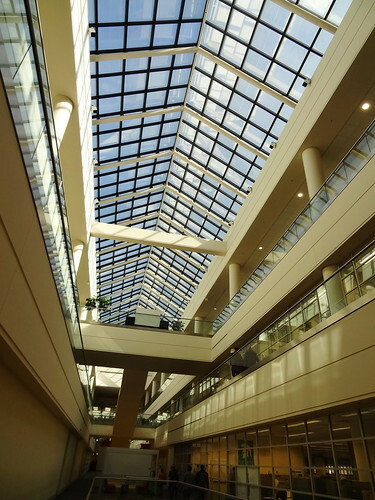 ft. the complex is the second-largest building in the United States in floor space, only the Pentagon is larger; as of April 2016, approximately 15,000 people work at the complex–wow! We join the crowd of visitors and take the escalator to the second floor. 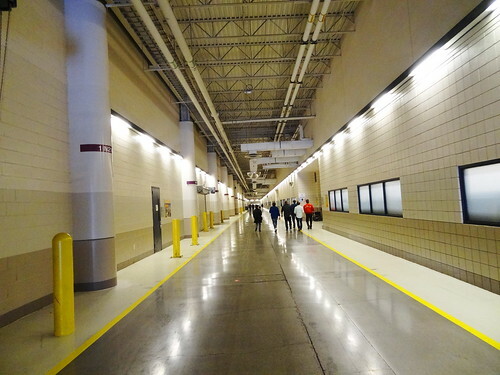 Carpeted corridors throughout the elongated atrium are lit by natural sunlight, hallways appear endless. I can’t even begin to describe the massiveness of this place, I’m sure you could hide the Fisher building in here; we seem to walk forever to get from one section to another. We pick up the pace passing pretzel stations (in case you get lost at least you have food! 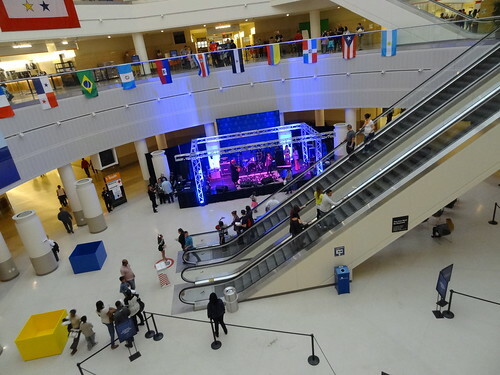 ), face painting and photo booths on our way back to the first floor, bands are between sets at Tech Plaza, we pause to check out the octagonal skylight, the center point of the building I presume; the place is buzzing with activity. I’m careful not to lose our friend, Kris keeps wandering off in a daze, I’m worried his head will explode!! 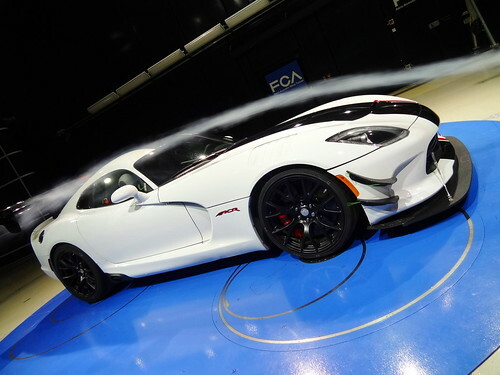 In the Noise, Vibration & Harshness Lab we see a burgundy Challenger Hellcat, sweet, next to that a gorgeous Viper in red with black stripes, this is so cool! 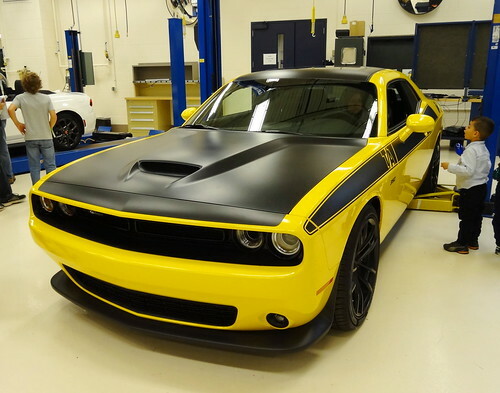 All eyes are on the Yellow Jacket T/A Challenger that was recently introduced to the public, look at that flat black hood and front spoiler, now that’s a muscle car! 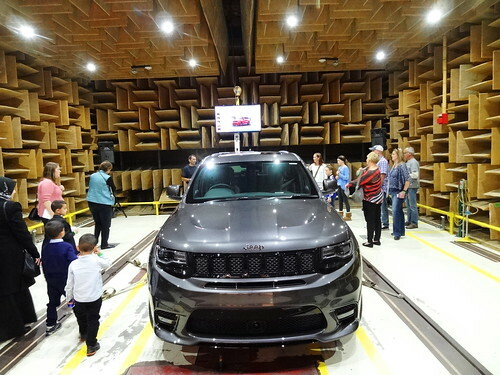 A silver Grand Cherokee sits with its rear wheels on rollers, this can simulate various driving conditions, I just noticed this model is right-hand drive. Adults and kids alike are attracted to the Power Wagon with the grey and red lettering and graphics, I think this is the off-road package. 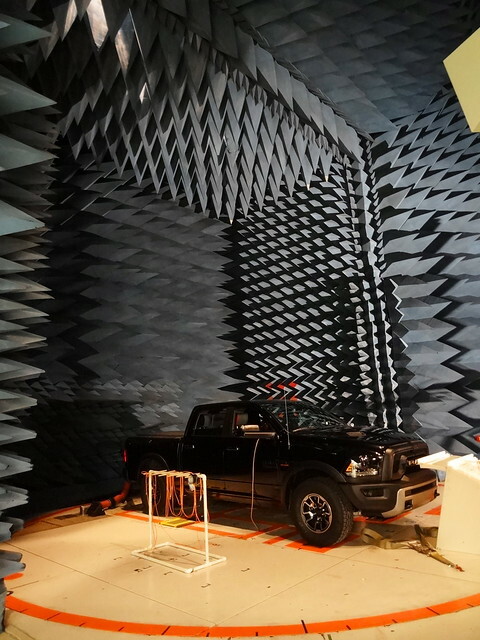 Over in the Electro Magnetic Compatibility Lab testing focuses on the vehicle’s electronic systems and how they operate when exposed to radio frequencies. Potential interference can come from radio and television towers, ham radios, cell phones and burglar alarms, guess I never thought about that before. 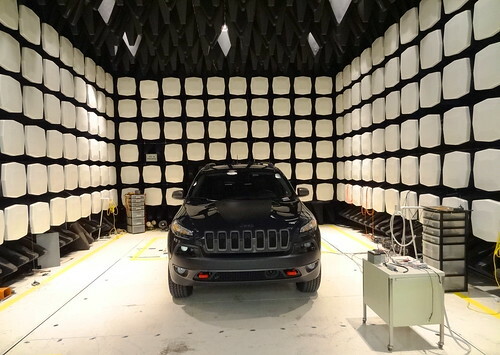 A Ram pick-up is in one of the chambers, I kind of dig those pointy cone-shaped things; a black Cherokee waits its turn in the Vehicle Shielded Test Room. Moving on to the Environmental Test Cells we follow a pathway through the cold test chamber, ‘cold’ is an understatement, it was freezing, which made the hot test chamber feel really good. 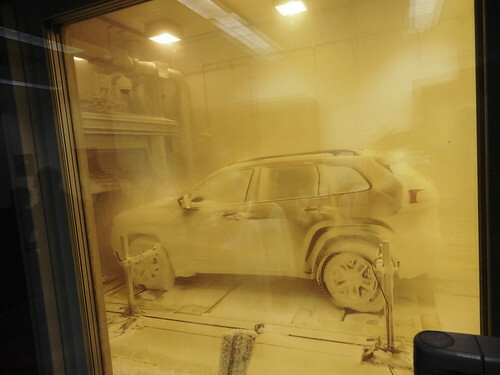 Standing in a small room we look through a glass panel into a driving cell, the snow-maker is on kill creating blizzard-like conditions, high winds blow snow directly into the front of a Cherokee; a not-so-subtle reminder of what we have to look forward to. Exiting the drive cell we come face to face with the refrigeration unit for all that white stuff. 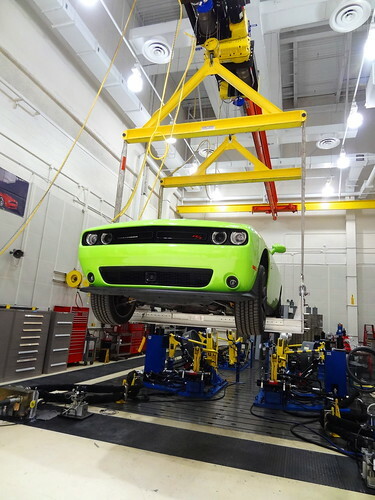 In another area we watch a road test simulator at work, a Cherokee is going for a test run; looks like a rough ride. A Limelight Challenger R/T and Jeep Wrangler Unlimited hang nearby waiting for their opportunity. Walking to the Pilot Plant we talk about all the things we’ve seen so far, most of us have no idea how much work goes into each model vehicle; from the very first idea put on paper, to the clay model, systems testing, to the build itself— all of which happens right here in this complex; it truly boggles the mind. 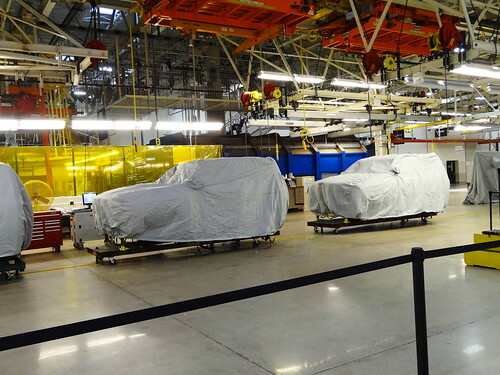 The Pilot Plant is basically an assembly line, new models are kept top-secret and are covered for our visit. 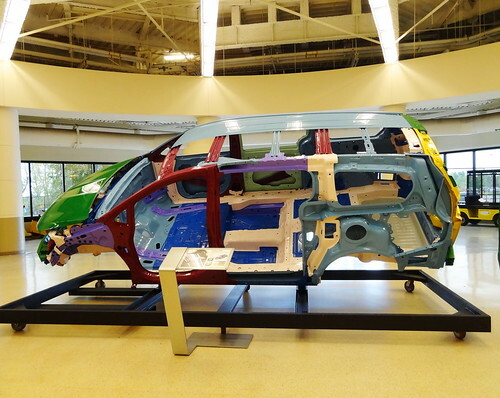 By building the initial vehicle here any problems that come up can be ironed out before the vehicle is put into assembly at the plant. 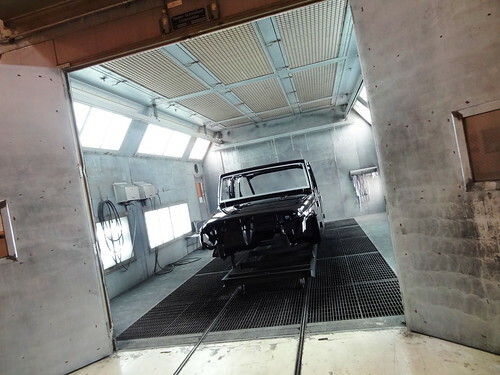 It’s fascinating to look at, bodies rest on wheeled platforms, tools and electrical cords dangle from the ceiling, parts are kept in sealed crates, in the paint booth a Wrangler wears a fresh coat of black. I think we’ve seen everything we can on the first floor, next up, Design.